requires only a modest input from specialists? Well, now there’s a killer-app for that. I recently had the distinct privilege of participating in this year’s Science Hack Day (SHD) in San Francisco as a Science Ambassador. On the surface, SHD is a science-themed hackathon: a weekend where people get together to collaboratively develop on neat ideas. More than this, though, Science Hack Day encapsulates precisely the joy of collaborative discovery and problem solving that drew me into a career in research. 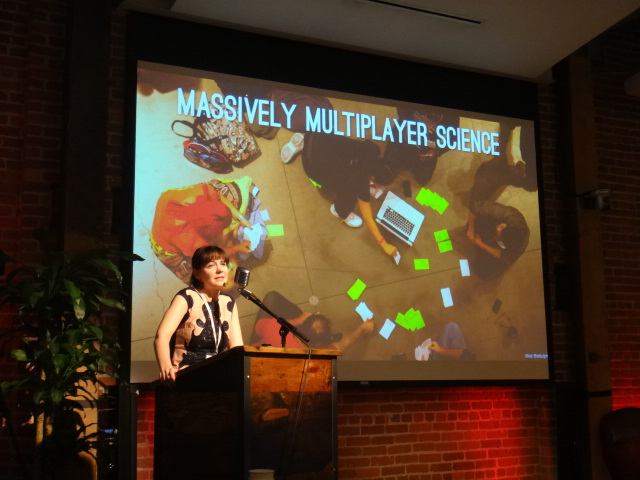 Ariel Waldman, ‘global instigator’ for Science Hack Day, gives the open remarks at Science Hack Day: SF. I cannot understate how much this resonated with me as a scientist: over the course of about 30 hours, SHD was able to create a microcosm of how we do science, and it was able to do so in a way that brought together people of very different age groups, genders, ethnicities, and professional backgrounds to hack and learn and create. Many of these projects made use of open data sets, and many of them ended up open source: either in the form of GitHub repositories for software or instructables for more physical creations. The hacks ranged from fun— such as a board game based on the immune system, to practical—a Chrome app that overlays CO2 emissions onto Google Maps. They were marketable—a 3D candy pen, and mesmerizing—an animation of 15 years of hand-drawn solar records. Some were simply inspiring, such as coordinating a day to view the rings of saturn to spark interest in science. One thing that especially rang true to me was that Science Hack Day—like the actual day-to-day science done by researchers—is not about deliverables. The science isn’t the poster that you glued together at your 4th grade science fair (or the journal article that is similarly glued together decades later), it’s all of the action before that. It’s about casual brainstorming, “literature reviews” looking for existing off-the-shelf tools, bumping into experts and getting their feedback, the many times things break—and the breakthroughs from understanding why, and then the devil-may-care kludges to get a prototype up and running with your teammates. All that is what I want to convey when people tell me that particle physics sounds neat, but what exactly is it that we do all day long in the ivory tower? Now I know the answer: we’re science hacking—and you can try it out, too. Ariel’s tips for Science Hack Day are also useful reminders for academic researchers… and really, probably for everyone. And this, if you ask me, is precisely what needs to be injected into science outreach. It’s always fantastic when people are wow’ed by inspiring talks by charismatic scientists—but nothing can replace the pure joy of actually putting on the proverbial lab coat and losing yourself in curiosity-based tinkering and problem solving. I owe a lot to Matt Bellis, a physicist and SHD veteran, for preparing me for SHD. He describes the event from the point of view of a scientist as “boots on the ground outreach.” Science Hack Day is a way to “engage” with the science-minded public in a meaningful way. And by “science-minded public,” I really mean a slice of the public are already interested in science, but are also interested in participating as citizen scientists, continuing to tinker with code on GitHub or even just spreading the joy of science-themed hacking to their respective communities. This is science wanting to go viral, and the SHD participants want to be patient zeroes. A shot of the crowd before project presentations at SHD:SF 2015. Image courtesy of Matt Biddulph. SHD is free, volunteer driven (an Avogadro’s number of thank yous to the SHD organizers and volunteers), and open to the community. The demographics of the crowd at SHD:SF was a lot closer to the actual population of San Francisco, and is thus a lot closer to the demographics that we academics want to also see reflected in the academy. Events like SHD aren’t just preaching to the choir, it’s a real opportunity to promote STEM fields broadly to underrepresented groups. In fact, think about the moment that you were hooked on science. For many of us, those moments are a combination of serendipity and opportunity. What would it take to bring that to make that spark accessible? SHD is one such event. And in fact, it even generated a science hack for precisely that. There was also a valuable message to glean from the crowd at the event: people want to play with data. And for the general public, they’re even happier when academics provide tools to play with data. Data doesn’t even have to be what you conventionally think of as data. Alex Parker’s “solar archive” won the “best use of data” award for a dataset of 15 years of daily hand drawn images of the sun by astronomers at the Mount Wilson Observatory. Alex’s team used image processing techniques to clean, organize, and animate the images. The result is hypnotic to watch, but is also a gateway to actual science education: what are these sun spots that they’re annotating? How did they draw these images? What can we learn from this record? 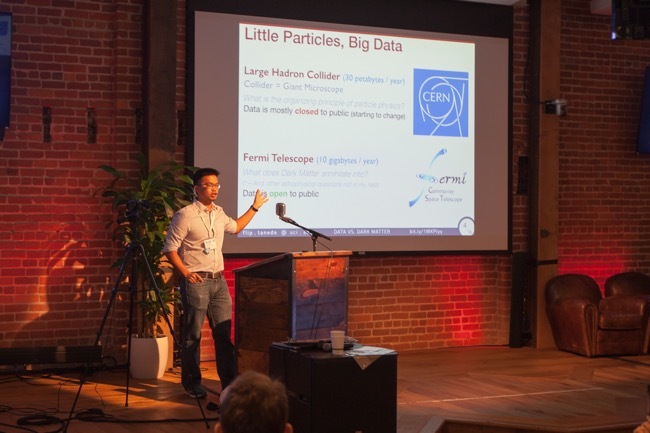 Giving a “lightning talk” on data sets in particle physics. Slides available. Open data sets are a little more difficult in particle physics: collider data is notoriously subtle to perform analyses—mostly because background subtraction typically requires advanced physics background. Nevertheless, our field is evolving slowly and there are now some options available. See my lightning talk slides for a brief discussion of these with links. The point, though, is that there is demand. And for the public, the more people demand open data sets—even just for “playing”—the more scientists will understand the potential for productive partnerships with citizen scientists. And for scientists: make your tools available. This holds true even for technical tools—GitHub is a great way to get your colleagues to pick up the research directions you find exciting by sharing Mathematica or Jupyter notebooks! 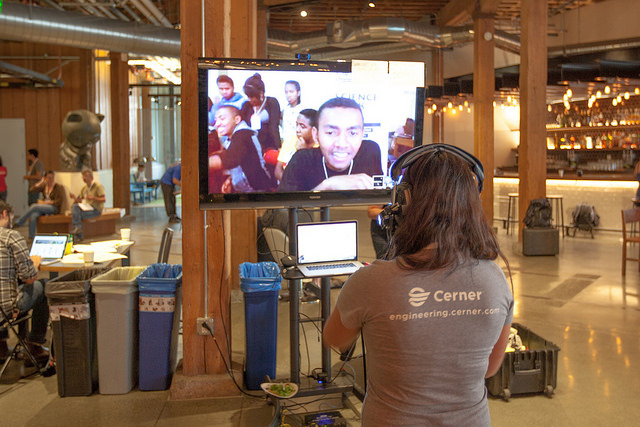 SHD San Francisco participants were able to video chat with participants from parallel SHD events going on in Berlin and Madagascar. Photo courtesy of Matt Biddulph. A quick look at the SHD main page shows that Science Hack Days are popping up all over the world. In true open source spirit, SHD even has a set of resources for putting together your own Science Hack Day event. In other words, Science Hack Day scales—you can build upon the experiences of past events to build your own. I suspect that there is untapped potential to seed Science Hack Day into universities, where many computer science departments have experience with hackathons and many physics departments have a large set of lecture demonstrations that may be amenable to hacking. Needless to say, the weekend turned me into a Science Hack Day believer. I strongly encourage anyone of any scientific background to try out one of these events: it’s a weekend that doesn’t require any advance planning (though it helps to brainstorm), and you’ll be surprised at neat things you can develop, and what neat new friends you make along the way. And that, to me, is a summary of what’s great about doing science. See you at the next Science Hack Day! Many thanks to the people who made SHD:SF so magical for me: Jun Axup and Rose Broome for delightful conversations and their enthusiasm, Matt Biddulph for taking photos, Mayank Kedia, Kris Kooi, and Chrisantha Perera for hacking with me, all of the volunteers and sponsors (especially the Sloan and Moore foundations for supporting the ambassador program), Matt Bellis for passing on his past projects and data sets, and all of the wonderful hackers who I got to learn from and chat with. 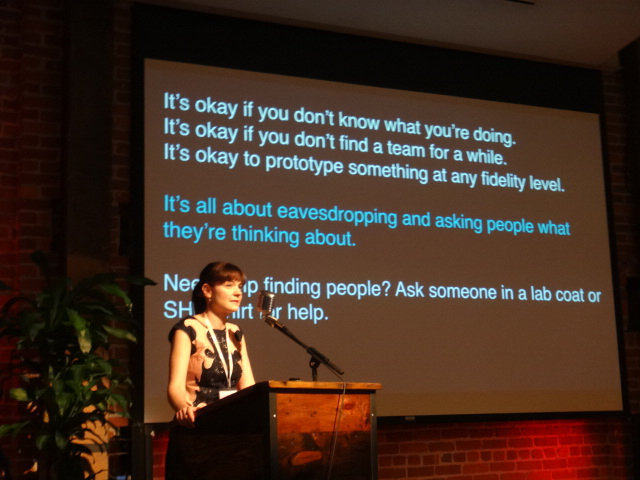 Most importantly, though, huge thanks and gratitude to Ariel Waldman, who is the driving force of the Science Hack Day movement and has brought so much joy and science to so many people while simultaneously being incredibly modest about her contributions.